Marvin has been having lots of fun trying to say some tongue twisters this week. A tongue twister is something that you try to say over and over again very fast without getting it mixed up. This can be very difficult and very funny, especially if you say it really fast. Try to say these tongue twisters really fast 5 times. 1) What did the sea say to the ocean? 2) What did one mountain say to the other mountain? 3) What kind of music do they play on a space shuttle? 4) If dogs go to obedience school where do cats go? 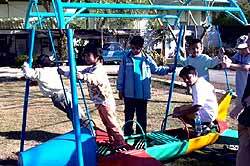 Jularat Pongtadsirikul, deputy secretary-general of YMCA, Chiang Mai, has announced that YMCA have arranged a YMCA Day Camp program for children development until April 2 at the YMCA building on Santitham Road. The day camp is being held from 9 a.m. to 4 p.m. daily. Some of the activities during the YMCA Day Camp include visiting Chiang Mai’s Wing 41 and its old planes. 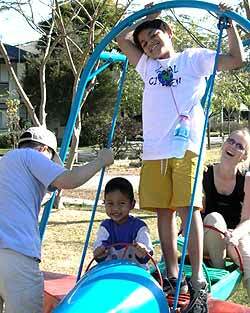 The day camp aims to develop children physically and mentally in line with YMCA’s principles. The camp will encourage children to love nature and the environment and promote good ethics and morals. It will also help develop their interpersonal skills and strengthen their confidence with many interesting activities, like art and handicrafts. For parents who are interested in sending their children to join the camps, please register at YMCA Chiang Mai (Santitham Road). For more information contact 053 221 819-20. Lanna’s students took center stage at the second annual ‘Talent at Twilight’ show, held in the cafeteria of Lanna International School on Thursday, February 19. 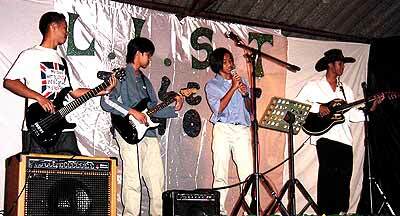 Lanna’s rock group is made up of (from left) Jerry (grade 11), Mike, Akhom and Mein (all grade 8). The house was packed with members of the Lanna community, and not one went away disappointed. I had to wipe away a tear or two myself, as I watched Lanna’s amazing students performing together. The show was as diverse as Lanna’s student body, ranging from classical ballet to Thai dance, from rap to theater, from piano to harmonica to electric guitar. The stage itself had been transformed by Lanna students, who created the backdrop and engineered the lighting. 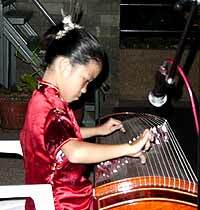 Prangthip Suppaiboonsuk (Sup) from grade 4 plays the ‘Knock Knock Joke’ on the Chinese Harp. The evening was a clear reminder that each student brings unique qualities, interests and talents to the school community. Stephanie Dawley, Lanna’s ESL coordinator, deserves praise for a job well done. She coordinated the evening, with the help from other teachers and staff. Their efforts provided Lanna’s students a great opportunity to work together in setting priorities and reaching goals. A lot of work went into this talent show, and it showed. Last Thursday, Prem students teamed up with a group of sixth graders from Uthaloy International School in China to visit the Vieng Ping Orphanage and lend a helping hand. 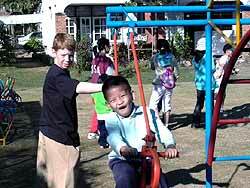 The students played with the kids, learned about how the orphanage operates, and had a whole lot of fun while doing it! The forty-four sixth grade students from Uthaloy International School were part of Prem’s Visiting Schools Program (VSP) and stayed at Prem from Feb. 22-28. Through the VSP, Uthaloy students were able to visit a wide variety of cultural and outdoors sites in and around Chiang Mai. 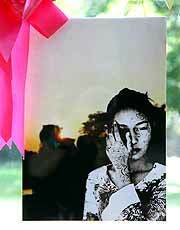 Their activities were not only designed to be fun; they were also meant to raise cultural and environmental awareness. Students from Prem and Uthaloy thoroughly enjoyed spending the morning together. The orphanage visit was followed by an introductory Thai cooking class, run by Chiang Mai Adventure. The cooking (and the eating) proved to be lots of fun, if a bit messy! The leaders and teachers from both schools agreed that by working together, both Prem and Uthaloy students learned a lot about each other and about teamwork. Prem students continue to benefit from their interactions with the students from the schools from many countries which visit the Prem Center through the Visiting Schools Program. Learning about orphans, and still having fun with them. Just playing together is adventure and fun. A variety of cultures, but children understand each other without words. Last Monday March 1, Joseph Maliha, a 12th grade student at Prem Tinsulanonda International School, was awarded the first prize in Citylife’s photo competition. The prize, which included a trophy as well as a free flight for two on a scenic tour of Chiang Mai run by the Chiang Mai Flying Club and Pilot School, was awarded by David Hopkinson, the Honorary British Consul. David Hopkinson, the Honorary British Consul congratulates Joseph Maliha, a 12th grade student at Prem Tinsulanonda International School for his success. Joseph explained that Prem has played a large part in developing his artistic talents. “The teachers here are really inspirational,” Joseph says. “They spend so much time and effort on each student, and it helps that there are also great art facilities.” In addition to devoting time to digital art, Joseph also participates in a wide variety of other activities at Prem. He plays on both the basketball and volleyball teams, is a senior representative of Prem’s Student Council, sings in the A Capella Choir, and manages the on-campus mini-store, all profits of which go directly to charity. Joseph has big plans for the future. He plans to apply for a scholarship to study computer animation next year at Ringling, an art school in Florida. Given his success in this competition, Joseph’s future prospects certainly seem bright! I-TIM, the International Hotel and Tourism Industry Management School, is awarding scholarships to students in need of financial support for the 33rd intake which commences in July 2004. 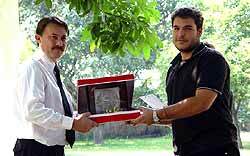 The scholarships are for I-TIM’s two-year diploma in Hotel and Tourism Management. Applications are available from I-TIM commencing on the 8th May. The scholarships for Thai students are valued at 68,000 Thai baht per year and will be awarded in both years of study subject to conditions. Scholarships for foreign students are valued at USD 1000 (about 40,000 baht - double pricing even applies to scholarships) per year and will also be valid for both years of study subject to conditions. Seven million baht budget put aside for lycra? Adisorn Suddee, general manager of Mac Media Chiang Mai revealed that the company estimated a seven million baht budget to hold the Cheerleaders Contest 2004, seeking the most talented Thailand lycra leaping champions. Rounds of the contest will be held in every region starting in June this year. The northern region semifinals are on June 26-27, at Lanna Hall, Central Airport Plaza, Chiang Mai. The winning teams from each regional contest will compete against each other at the final round on August 14 at Lanna Hall in the Central Airport Plaza. The Thailand champions from the final round will receive trophies donated in the name of Her Majesty the Queen. The contest is divided into two levels: high school and university levels. Cheerleader teams that would like to take this challenge can apply now for the competition. For more information, please contact Mac Media Chiang Mai on Mahidol Road or call 053 202 192 and fax 053 202 193.